Tim Linder has a great idea. 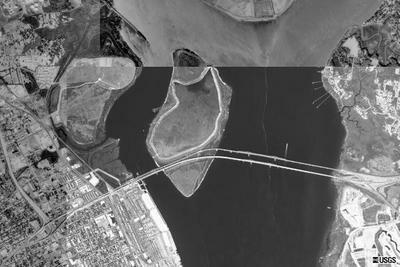 What about collecting aerial and satellite images acquired during the construction of the new Cooper River Bridge. We found this image from the US Geological Survey (1999). In addition, the US Geological Survey has a very useful image browser. This link includes southern South Carolina. Terraserver.com has a more recent (October 13, 2003) photo from GlobeXplorer at coordinates: Latitude: 32.8070077 , Longitude: -79.927839 .